East Antrim boasts five players in the Northern Ireland squad for next week’s friendly in Scotland and the big Euro 2016 Qualifier against Finland at Windsor Park. Manchester United’s Jonny Evans, currently serving a six-match match ban for being found guilty of spitting at Newcastle’s Papiss Cisse, returns to the panel. The former Belfast High School pupil missed November’s Euro qualifier defeat to Romania because of injury. At the tender age of 19, Evans’ Old Trafford team-mate, Paddy McNair, is the youngest member of the squad and the only one who has yet to be capped. The Ballyclare man, an unused sub in Bucharest, has been tipped to be handed his first appearance in a green shirt. 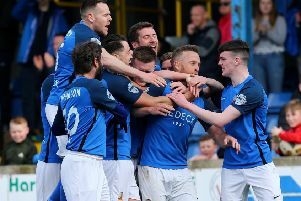 It would be the icing on the cake of what’s been a monumental breakthrough season for the ex-Ballyclare Secondary School pupil. From youth to experience, and West Brom defender Gareth McAuley is also among the 27 players selected by manager Michael O’Neill. The Larne man has faced the Scots in a ‘B’ international in 2003, and was part of the Nigel Worthington’s side which drew 0-0 at Hampden in 2008. Craig Cathcart and Corry Evans, who have 37 caps between them, could also have a big part to play as Northern Ireland aim to keep the heat on Group F leaders, Romania.